For the first time in some years, I’m spending two and a half weeks at CERN (the lab that hosts the Large Hadron Collider [LHC]). Most of my recent visits have been short or virtual, but this time* there’s a theory workshop that has collected together a number of theoretical particle physicists, and it’s a good opportunity for all of us to catch up with the latest creative ideas in the subject. It’s also an opportunity to catch a glimpse of the furtive immensity of Mont Blanc, a hulking bump on the southern horizon, although only if (as is rarely the case) nature offers clear and beautiful weather. More importantly, new results on the data collected so far in 2016 at the LHC are coming very soon! They will be presented at the ICHEP conference that will be held in Chicago starting August 3rd. And there’s something we’ll be watching closely. Why the excitement? A bump of this type can be a signal of a new particle (as was the case for the Higgs particle itself.) And since a new particle that would produce a bump of this size was both completely unexpected and completely plausible, there was hope that we were seeing a hint of something new and important. and I went on to discuss briefly what it might mean if it wasn’t just a statistical fluke. But speculation may be about to end: finally, we’re about to find out if it was indeed just a fluke — or a sign of something real. Since December the amount of 13 TeV collision data available at ATLAS and CMS (the two general purpose experiments at the LHC) has roughly quadrupled, which means that typical bumps and wiggles on their 2015-2016 plots have decreased in relative size by about a factor of two (= square root of four). If the December bump is just randomness, it should also decrease in relative size. If it’s real, it should remain roughly the same relative size, but appear more prominent relative to the random bumps and wiggles around it. Now, there’s a caution to be added here. The December ATLAS bump was so large and fat compared to what was seen at CMS that (since reality has to appear the same at both experiments, once enough data has been collected) it was pretty obvious that even if it there were a real bump there, at ATLAS it was probably in combination with a statistical fluke that made it look larger and fatter than its true nature. [Something similar happened with the Higgs; the initial bump that ATLAS saw was twice as big as expected, which is why it showed up so early, but it gradually has shrunk as more data has been collected and it is now close to its expected size. In retrospect, that tells us that ATLAS’s original signal was indeed combined with a statistical fluke that made it appear larger than it really is.] What that means is that even if the December bumps were real, we would expect the ATLAS bump to shrink in size (but not statistical significance) and we would expect the CMS bump to remain of similar size (but grow in statistical significance). Remember, though, that “expectation” is not certainty, because at every stage statistical flukes (up or down) are possible. In about a week we’ll find out where things currently stand. But the mood, as I read it here in the hallways and cafeteria, is not one of excitement. Moreover, the fact that the update to the results is (at the moment) unobtrusively scheduled for a parallel session of the ICHEP conference next Friday, afternoon time at CERN, suggests we’re not going to see convincing evidence of anything exciting. If so, then the remaining question will be whether the reverse is true: whether the data will show convincing evidence that the December bump was definitely a fluke. Flukes are guaranteed; with limited amounts of data, they can’t be avoided. Discoveries, on the other hand, require skill, insight, and luck: you must ask a good question, address it with the best available methods, and be fortunate enough that (as is rarely the case) nature offers a clear and interesting answer. *I am grateful for the CERN theory group’s financial support during this visit. This suggested the possibility of an unknown particle of some type with rest mass of 750 GeV/c². However, the excess could just be a statistical fluke, of no scientific importance and destined to vanish with more data. ability to use 2015 collisions taken when their giant magnet wasn’t working — fortunately, the one type of particle whose identity and energy can be measured without a magnet is… a photon! ATLAS 2015+2012 data: not reported, but clearly goes up a bit more, by perhaps half a sigma? You can read a few more details at Resonaances. This is good news, but it doesn’t really reflect a qualitative change in the situation. It leaves us slightly more optimistic (which is much better than the alternative!) but, as noted in December, we still won’t actually know anything until we have either (a) more data to firm up the evidence for these bumps, or (b) a discovery of a completely independent clue, perhaps in existing data. Efforts for (b) are underway, and of course (a) will get going when the LHC starts again… soon! Next news on this probably not til June at the earliest… unless we’re very lucky! So What Is It? That’s the question one hears in all the bars and on all the street corners and on every Twitter feed and in the whispering of the wind. Everybody wants to know. That bump seen on the ATLAS and CMS two-photon plots! What… IS… it…? The two-photon results from ATLAS (top) and CMS (bottom) aligned, so that the 600, 700 and 800 GeV locations (blue vertical lines) line up almost perfectly. The peaks in the two data sets are in about the same location. ATLAS’s is larger and also wider. Click here for more commentary. Well, to be honest, probably it’s just that: a bump on a plot. But just in case it’s not — just in case it really is the sign of a new particle in Large Hadron Collider [LHC] data — let me (start to) address the question. I find the following plot useful… it shows the results on photon pairs from ATLAS and CMS superposed for comparison. 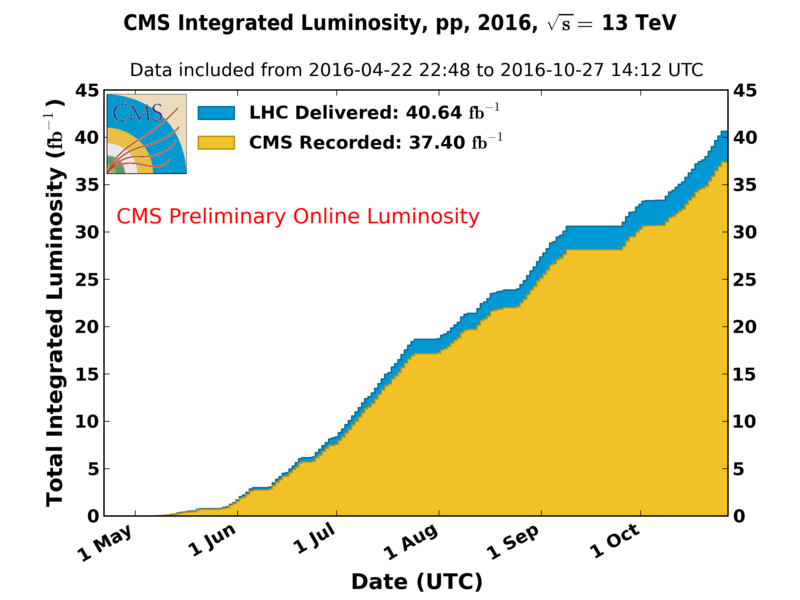 [I take only the central events from CMS because the events that have a photon in the endcap don’t show much (there are excesses and deficits in the interesting region) and because it makes the plot too cluttered; suffice it to say that the endcap photons show nothing unusual.] The challenge is that ATLAS uses a linear horizontal axis while CMS uses a logarithmic one, but in the interesting region of 600-800 GeV you can more or less line them up. Notice that CMS’s bins are narrower than ATLAS’s by a factor of 2. The diphoton results from ATLAS (top) and CMS (bottom) arranged so that the 600, 700 and 800 GeV locations (blue vertical lines) line up almost perfectly. (The plots do not line up away from this region!) The data are the black dots (ignore the bottom section of CMS’s plot for now.) Notice that the obvious bumps in the two data sets appear in more or less the same place. The bump in ATLAS’s data is both higher (more statistically significant) and significantly wider. Both plots definitely show a bump. The two experiments have rather similar amounts of data, so we might have hoped for something more similar in the bumps, but the number of events in each bump is small and statistical flukes can play all sorts of tricks. We’re in that interesting moment when all we can say is that there might be something real and new in this data, and we have to take it very seriously. We also have to take the statistical analyses of these bumps seriously, and they’re not as promising as these bumps look by eye. If I hadn’t seen the statistical significances that ATLAS and CMS quoted, I’d have been more optimistic. By the way, we heard that the excess events do not look very different from the events seen on either side of the bump; they don’t, for instance, have much higher total energy. That means that a higher-energy process, one that produces a new particle at 750 GeV indirectly, can’t be a cause of big jump in the 13 TeV production rate relative to 8 TeV. So one can’t hide behind this possible explanation for why a putative signal is seen brightly in Run 2 and was barely seen, if at all, in Run 1. Of course the number of events is small and so these oddities could just be due to statistical flukes doing funny things with a real signal. The question is whether it could just be statistical flukes doing funny things with the known background, which also has a small number of events. And we should also, in tempering our enthusiasm, remember this plot: the diboson excess that so many were excited about this summer. Bumps often appear, and they usually go away. R.I.P. The most dramatic of the excesses in the production of two W or Z bosons from Run 1 data, as seen in ATLAS work published earlier this year. That bump excited a lot of people. But it doesn’t appear to be supported by Run 2 data. A cautionary tale. Nevertheless, there’s nothing about this diphoton excess which makes it obvious that one should be pessimistic about it. It’s inconclusive: depending on the statistical questions you ask (whether you combine ATLAS and CMS Run 2, whether you try to combine ATLAS Run 1 and Run 2, whether you worry about whether the resonance is wide or narrow), you can draw positive or agnostic conclusions. It’s hard to draw entirely negative conclusions… and that’s a reason for optimism. Six months or so from now — or less, if we can use this excess as a clue to find something more convincing within the existing data — we’ll likely say “R.I.P.” again. Will we bury this little excess, or the Standard Model itself? CMS results are being presented by Jim Olsen of Princeton University. CMS has magnet problems this year due to cooling system problems but was able to record 3/4 of the data with the magnet on. The diboson excess widely discussed this summer is, perhaps not surprisingly, not confirmed. Same for the old dilepton excesses. With certain assumptions, limits on gluinos jump from 1.3 TeV – 1.4 TeV to 1.6-1.7 TeV. Top-primes — limits jump to about 950 GeV relative to 800, again with assumptions. Some new limits on invisible particles. W’ resonances ruled out up to 4.2 TeV if they decay to leptons, to 2.4 TeV if they decay to top quark + bottom antiquark (with assumptions.) No dijet bumps or other unusual dijet behavior. No dilepton bumps up to 2.5 – 3.1 TeV for simple assumptions. Diphotons (with 2.6 inverse fb of data)! (Olsen shows an event at 745 GeV). All diphoton events used. Peak? Yes!! BUT: local 2.6 standard deviations, and with the look elsewhere effect, only 1.2 standard deviations. Not impressive. Such a peak is not inconsistent with previous results, but doesn’t look like a signal. Still… combining old and new data we see a signal at 3 standard deviations local, 1.7 standard deviations globally after look elsewhere effect. Also the peak is rather ragged, though this doesn’t imply anything in particular; it is worth noting. If you assume the peak comes from a wider bump, the significance goes down. Now on to ATLAS, with results presented by Marumi Kado (from the French Laboratoire de l’Accelerateur Lineaire and Orsay). ATLAS has 1.2-1.5 times more useable data than CMS. This could be important. Look for Higgs in four leptons. Big statistical fluke! They see fewer events than expected! This is, of course, no big deal… if you expect 6 events it is no surprise if you happen to see 2. No peak in two Z’s at higher mass (i.e. no heavy Higgs seen.) Some improvement in searches for Heavy Higgs particles decaying to taus at higher mass. Limits on gluinos (with assumptions) go from 1.2-1.4 TeV to 1.4-1.8 TeV. (Got an improvement by looking for boosted top quarks in the case where gluinos decay to top quarks.) Bottom squarks (with assumptions) — limits go from 650 GeV to 850 GeV. The excess in Z + jets + invisible particles in high energy events remains in Run 2, a little smaller than in Run 1 but still there. [Run 1: 10 expected, 29 observed; Run 2: 10 expected, 21 observed.] CMS still doesn’t see it. What’s the story here? A completely generic search for photon pairs; nothing special or unusual. Looking for bump with narrow width up to large width. 3.6 standard deviations local, global significance is 1.9 standard deviations. Looks amusingly similar to the first hint of a Higgs bump from four years ago! Large width preferred, as much as 45 GeV. Local significance goes up to 3.9 standard deviations, 2.3 after look elsewhere. Mass about 750 GeV. Hmm. No indication as to why they should have been more efficient than in Run 1, or why such an excess wouldn’t have been seen at Run 1. WW or ZW or ZZ where there was an excess in Run 1. As with CMS, no excess seen in Run 2. WH,ZH: Nothing unusual. Ok, now for the questions. The diphoton bump seen, with moderate significance in ATLAS and low significance at CMS, is very interesting, but without more information and more thought and discussion, it’s premature to say anything definitive. Kado says: Run 1 two-photon data was reanalyzed by ATLAS and it is compatible with the Run 2 bump for large width at 1.4 standard deviations, less compatible for narrow width at more than 2 standard deviations. They have not combined Run 1 and Run 2 data yet. Kado says: the diphoton excess events look like the background, with no sign of extra energetic jets, invisible particles, etc; nothing that indicates a signal with widely different properties sitting over the standard two-photon background. (Obviously — if it had been otherwise they could have used this to reduce background and claim something more significant.) There are about 40 events in the peak region (but how wide is he taking it to be?) Olsen: CMS has 10 events in the same region, too little to say much. Conclusion? The Standard Model isn’t dead yet… but we need to watch this closely… or think of another question.